Ripe and plentiful! These words swirl in my head with the abundance of mid-summer’s bounty and I am almost giddy as I stuff my basket at the markets. Last week I just couldn’t resist a flat of blackberries. We are living outdoors every moment possible, savoring what is truly the most glorious summer Seattle has experienced in many, many years. 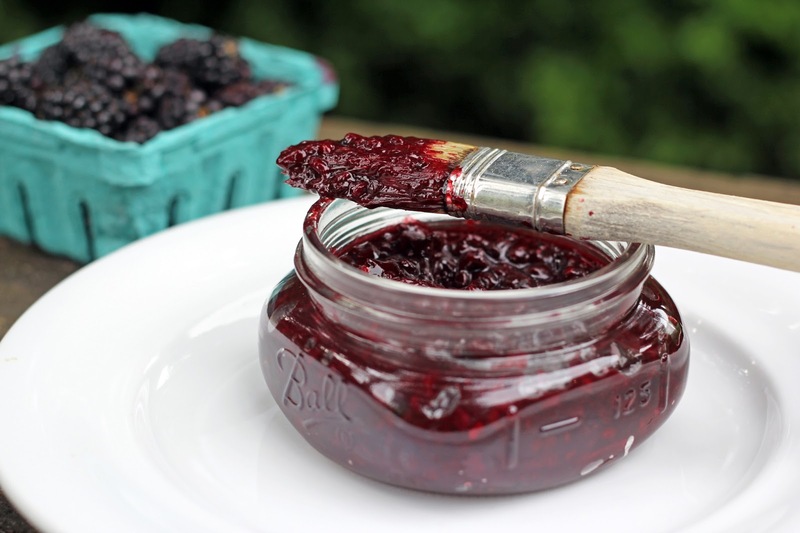 That means a long, delicious barbecue season, and since I’m always up for making condiments (I shared my love of homemade condiments here) I decided to get creative and try my hand at a new barbecue sauce using those luscious blackberries. 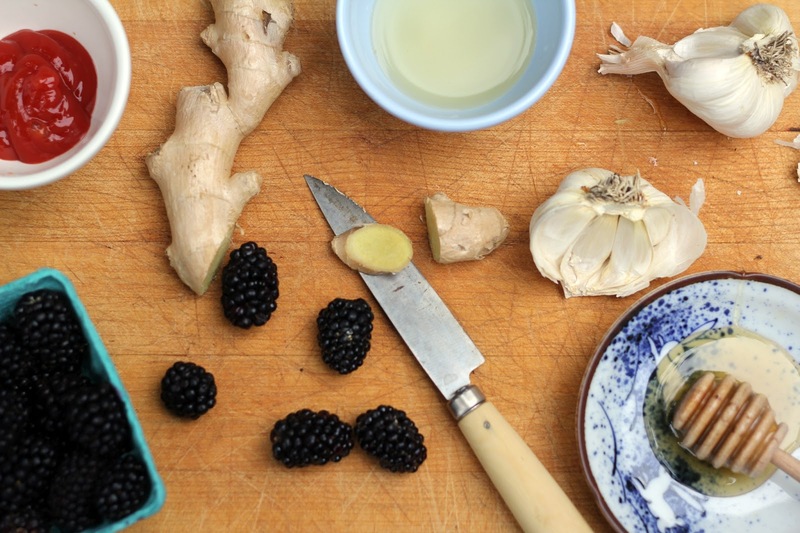 Fresh blackberries are simmered with a bright splash of cider vinegar, a squeeze of ketchup, some minced garlic and ginger, and a kiss of honey to round it out. At the last minute, I threw in a few grinds of black pepper and a couple shakes of crushed red chile peppers to pump up the spice. Yes, this is a bold sauce! Vivid violet and viscous, it does indeed have a warm kick which is tempered a bit when spread on chicken or beef before grilling. If your blackberry bushes are bursting, this is a wonderful, savory way to cook with these little gems. Speaking of blackberry bushes, we heard a marvelous bluegrass band play on July 4th called the Blackberry Bushes Stringband. If you’re in the Northwest, I recommend seeing them. And I have another recommendation for you ... one I’m super excited about! My new favorite cooking show is Kitchen Circus, and it was just released in its entirety on July 16th. Chef Thierry Rautureau, locally nicknamed The Chef in the Hat, is a Seattle celebrity and this show features home cooks competing together in his restaurant kitchen. My lovely friend, Erina, of The Attainable Gourmet is one of the contestants, too! I had the pleasure of seeing some sneak peeks and this is one fun, exciting show. I hope you check it out! Combine all the ingredients in medium-sized sauce pan, stir and bring to a boil. Stir and lower the heat to a simmer. Let the sauce simmer for about 15 minutes, gently crushing the berries with the back of a wooden spoon and stirring to make sure it doesn’t stick. When the mixture has thickened, remove from the heat and let cool. The sauce will keep in a covered jar in the fridge for 2 weeks. Brush it on chicken or beef before grilling. Reserve some additional sauce to brush on just before serving, if desired. I love this!!! 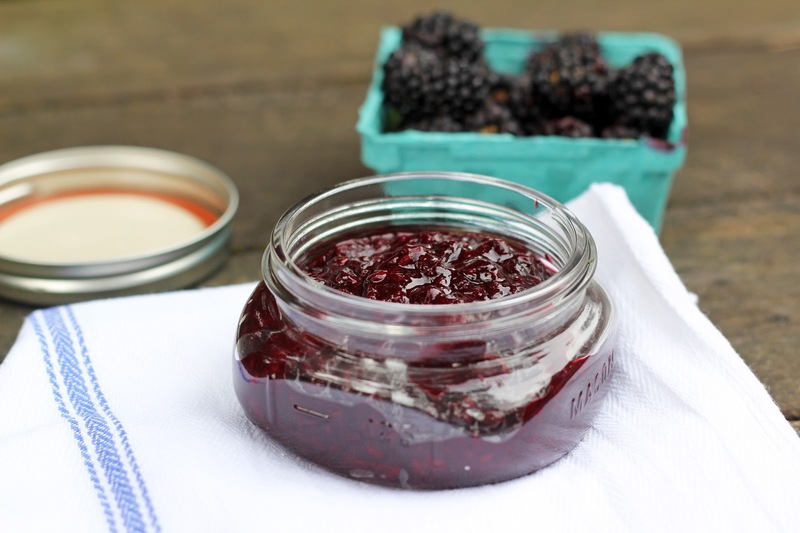 Blackberries are my favorite berry and this recipe is simple to make, sounds absolutely delicious. I can taste it now on some ribs!! Saved. Thank you, Suzanne! We grilled boneless chicken thighs with it slathered on last night, and we're going to try it on steaks next. I hope you enjoy it - ribs sounds like a wonderful choice! What a fabulous looking sauce. I love your description of how we Seattle-ites approach summer. Always outside...all the time. Thank you for the Kitchen Circus shout-out. Was so fun to see you the other night. I love blackberries! And this looks like a fabulous way to use them! Thanks for the recipe. My pleasure, Sarah! I'm loving all our blackberries right now. I hope you enjoy the sauce! Happy summer to you! The flavor combination here is awesome Hannah - I have a weakness for fresh blackberries and rarely do anything with them but eat them in their natural state (probably because the seasson is so short!) but I think we would really enjoy this on some grilled chicken! Thanks, Alyssa! I tend to eat berries fresh most of the time, too (I'm gobbling blueberries as I write...) but I do enjoy cooking with them, as well. I hope you enjoy the sauce! Can't wait to hear about your Canadian adventures. I've never had a blackberry BBQ sauce before! Super idea - I'd expect the flavor would be wonderful. I'll bet this would be nice with pork, too. Really good stuff - thanks so much. Thank you, John! There's a nice balance of sweet, savory and spicy in the sauce - blackberries seem to marry well with bold flavors. I hope you enjoy it if you give it a try! Wow - I have never made anything like this. How fun. I bet it would be fabulous on pork too (clearly I don't keep kosher). Glad you are having a great Seattle summer. What channel is this new show on - if you recommend it - I will check it out! Oh you are a clever girl...I love this sauce! Oh, thank you, Karen! I appreciate your kind words. I hope you're enjoying a marvelous summer. This sounds divine. 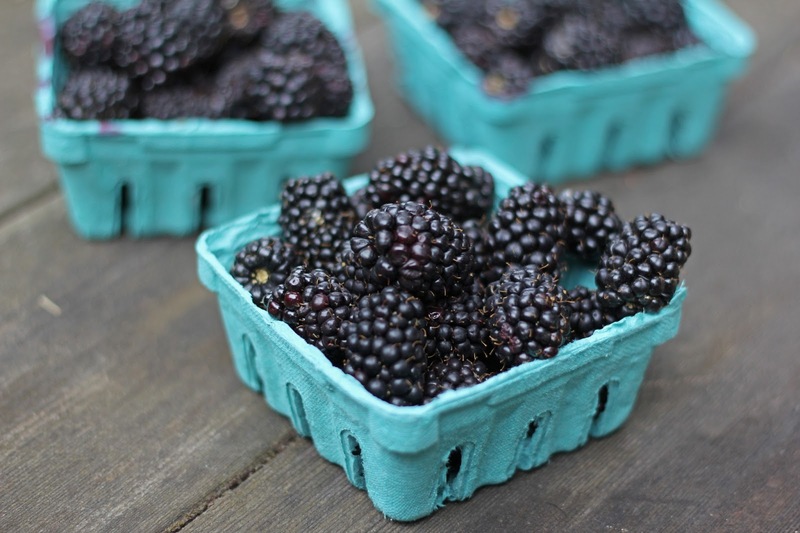 I just bought blackberries at the farmers market. The trick is to not eat all of them so I can make this! Thank you, Lynda! Putting some berries aside is indeed a challenge...I have to hide them if I want to do anything other than gobble them up! I hope you're enjoying a wonderful summer so far. Hannah, this sounds like the best thing ever! And your description is so wonderful! I can just taste this already. We've been grilling a lot, also. It's too hot to cook and just warm enough to eat outside! I'm so glad the weather has been nice for you this year, and I love that you're taking such advantage of it. I love local food shows. They do such a great job at conveying local culture. We have a couple in Maine that are so good. They're more about restaurants and less about cooking, but they are so fun! Hannah, this recipe is super special! I did make some adjustments, however. Blackberries can stand up to much more than we might expect. I doubled the ginger, added some molasses, as well as my secret ingredient Cardamom! I even served it on a Salmon steak. Hi Chef Moji! I'm delighted you made this sauce and appreciate you sharing your creative additions. I love it all! I'm such fan of cardamom and next time I'm definitely adding some molasses. Serving on salmon is terrific, too. Thanks so much for letting me know! I hope you're enjoying a lovely summer. Mmmmmm! Our neighbors have invited us to pick blackberries when they ripen (here in New England, we're another couple weeks out)in their blackberry patch! This BBQ sauce looks just the ticket for mass producing for my little church fair ... I'm betting the men will love idea of slathering it on grilled chicken ! My pleasure, Susan! What a treat to have access to a blackberry patch. This would be a terrific sauce to share at your church fair - I hope you enjoy it. I'm happy you stopped by! Cool stuff, I always pick blackberries here in Sweden but I never tried them in anything close to this, cool! Can this be canned like jam?? Hi Sydnee, I don't know if there is enough acid here to safely can this sauce, so I wouldn't recommend it. I'm just (finally!) learning more about long-term preserving this summer and hope to share some sauces for canning. Thanks for stopping by! wow looking great and i did make some adjustments, however. Blackberries can stand up to much more than we might expect.